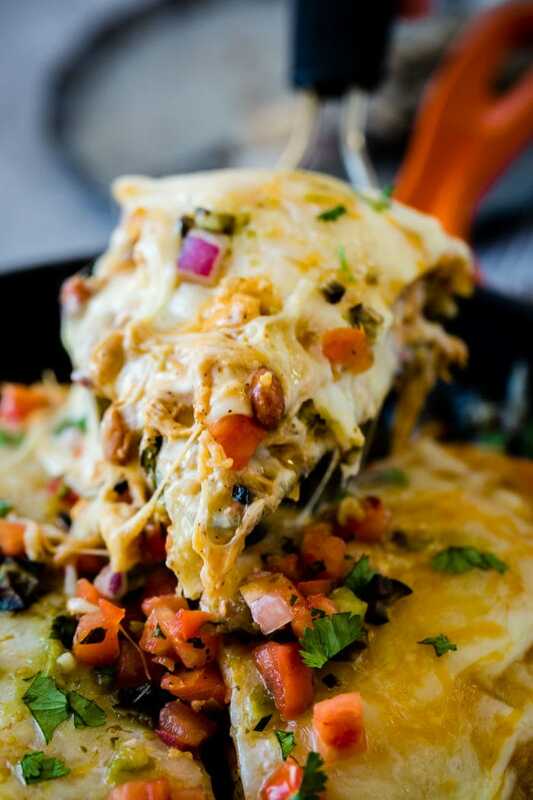 Loved our One Skillet Enchilada Casserole? Us too. That’s why today we are bringing you a lighter One Skillet Honey Lime Chicken Enchiladas Casserole. One skillet recipes, one pot recipes and one pan recipes are getting searched for left and right on our site and we can barely even keep up! We love it though because we are totally with ya. These recipes are often quick and easy and don’t require crazy lists of ingredients. 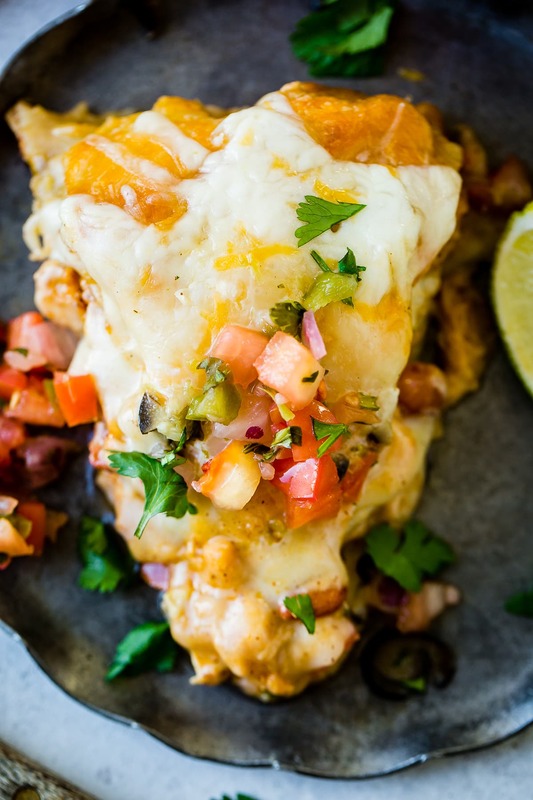 If our Honey Lime Chicken Enchiladas have done so well over the years how could we not bring on a whole new variation that is similar to the original but even easier?! Want to know my secret? I buy rotisserie chickens or the pre-shredded rotisserie chicken from Costco and I use our Food Saver to freeze it. That thing has been the best investment ever! We freeze everything from soups and sauces to whole meals with it and unlike freezer meals others are putting in zip top bags or wrapping in foil, these totally stay fresh. Make sure you snag our favorite Cast Iron Skillet for this one. If you have a smaller family just get a smaller size. Some cast iron skillet tend to peel more or aren’t as durable and while you actually don’t have to buy the most expensive one, hence the reason our favorite is the Lodge brand, you do need quality. It’s such a great pan to cook in as things cook evenly and the flavors are fantastic in cast iron. 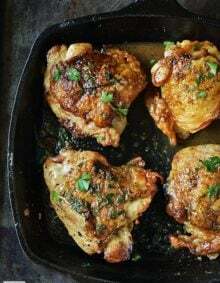 You use less oil when you cook with cast iron. A well-seasoned pan renders it virtually nonstick, which is why this skillet works so well. The health bonus, of course, is that you won’t need to use gads of oil to brown crispy potatoes or sear chicken when cooking in cast iron. We love to use fresh corn or flour tortillas, or at least the Tortilla Land uncooked tortillas, which again we get from Costco. We should seriously be ambassadors for both brands with how much we talk about them. Mix the chicken mixture and set aside. Mix your sauce mixture, set aside. Drain and rinse your canned pinto beans, or black beans would be fine, but a pinto bean is even more mild which goes well with the honey lime flavors. Spread a little sauce on the bottom of your cast iron pan just like you would with lasagna or enchiladas. Now all you do is layer things. Layer tortillas, chicken, beans, sauce, cheese, and start over until everything is piled as high as the pan. 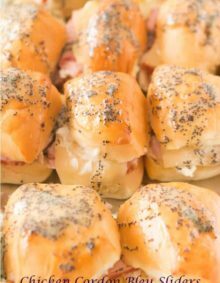 Bake until hot and bubbling, or wrap in foil for up to 12 hours before baking. See, it’s a great make ahead dinner recipe idea! Well, yes, but that cream mixture and the fact that you have it in a skillet can be tricky. If you want to freeze this one skillet honey lime chicken enchiladas casserole just make it in a reusable foil pan and wrap it well with foil and saran wrap. Only leave it in the freezer for up to 3 weeks. 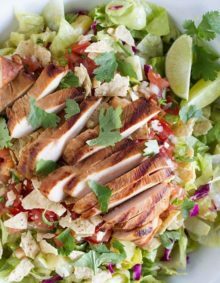 We like to serve this dinner with our Cilantro Lime Rice Cafe Rio Copycat, our Fresh Homemade Salsa and a simple salad. Or even just with the chips and salsa. Not what you’re looking for? Check out our Cheesy Black Beans and Rice! 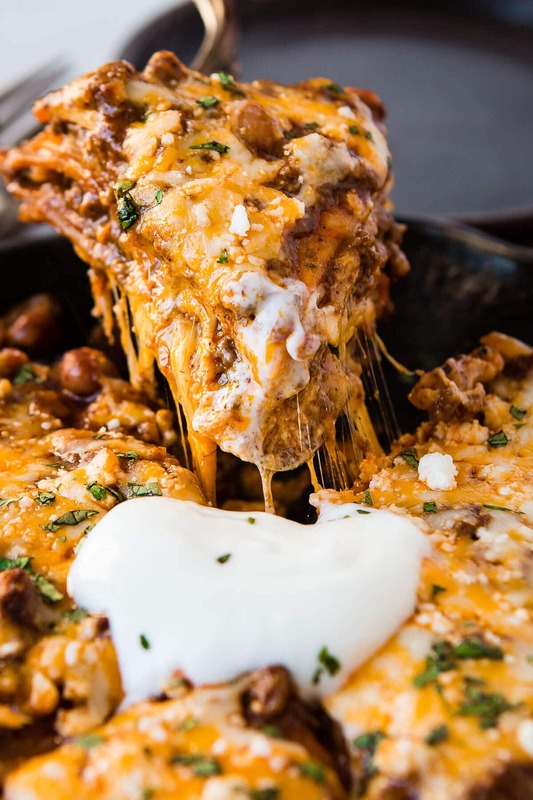 So you loved our One Skillet Enchilada Casserole? Us too. That's why today we are bringing you a lighter One Skillet Honey Lime Chicken Enchiladas Casserole. In a large bowl, place the honey, lime juice, chili powder and minced garlic or garlic powder. Place the cooked and shredded chicken in the bowl, stir to combine and cover with plastic wrap. Allow to marinate while you prepare the rest, 30 minutes or up to 1 hour, in the refrigerator. Cook the tortillas and set aside. Spread about 1/2 cup of the mixture in the bottom of a cast iron skillet, a 10-12" size. Place a tortilla down. Add a large spoonful (about 2 tablespoons) of the chicken mixture all over the tortilla. Sprinkle with beans and a little sauce. Cover with cheese, then repeat with remaining layers. On the last layer, end with a tortilla, sauce and cheese. 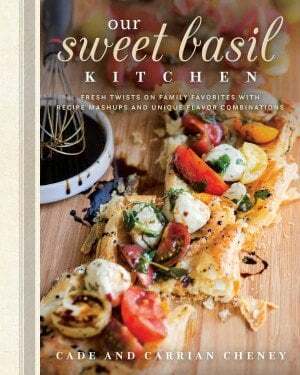 Serve with salsa, olives, sour cream or whatever flavors you like. This dish can be prepped up to 12 hours before baking. You can also freeze this meal if you make it in a disposable pan and wrap well with plastic wrap and foil for up to 3 weeks. 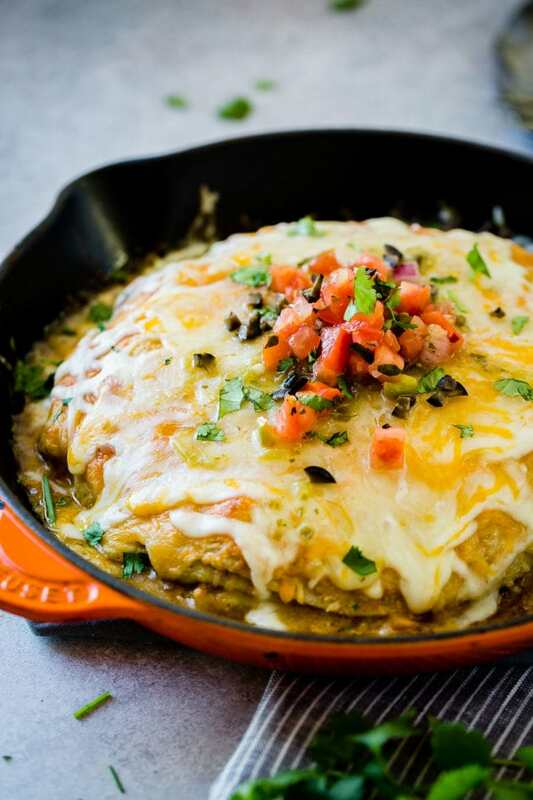 One skillet is all you need to make this killer recipe for enchiladas casserole! This was so good! I am excited to eat the leftovers for lunch today. I used uncooked/fresh flour tortillas in the recipe and I can see why corn would be tasty as well. I’ve never seen fresh corn tortillas though. I’ll have to keep an eye out of those. I loved the slight sweetness to the chicken. I added half a brick of softened cream cheese to the sauce and then I mixed the sauce with the chicken and beans so I was only scooping ONE thing onto each tortilla. My only tiny little critique is that this recipe is not a true one-skillet meal. I used three bowls (on accident – I could have used just two had I planned better). 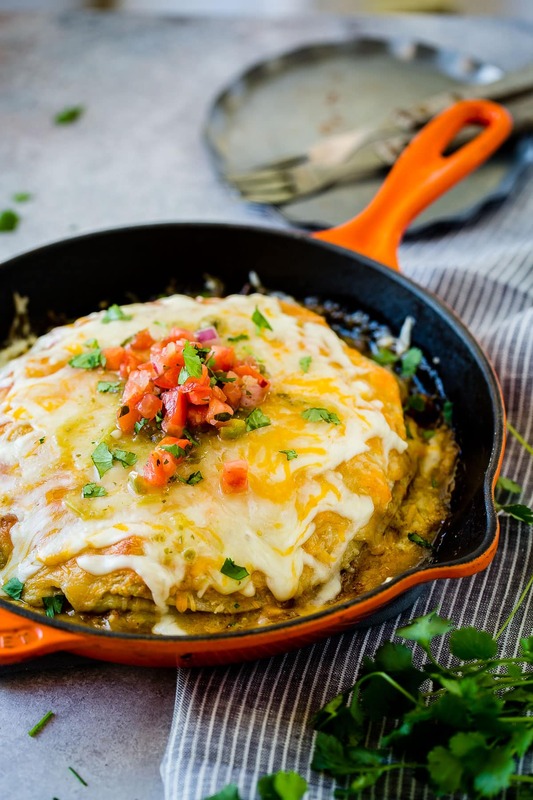 So maybe change the name to HONEY LIME CHICKEN ENCHILADAS SKILLET CASSEROLE because when I see “One-Skillet”, I assume it’s all made in one skillet – no other dishes required. But I’m glad I made it and will definitely make them again. I’d even use the chicken for tacos or nachos. It was really, really good. I thought it might be another dish that tastes like taco soup but it could not have been further from that. And all of my kids loved it. That’s a great point on the bowls and so happy to hear you liked it! I can’t wait to try your cream cheese idea! Oh that’s so funny! haha, yes you totally can! hey girl- this looks oh so divine! This looks delicious. Can you use red enchilada sauce instead of green in this recipe? I really really like mexican food, so thank you. 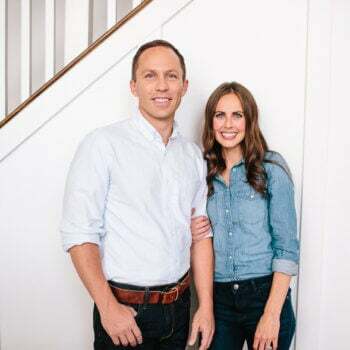 Also, thank you for saying, ‘….a pinto bean is even more mild…’ because I have never had pinto beans and my daughter likes mild food, whereas I like spicy!